Please contact us with the contact form to report difficulties, strange behaviors or persistent problems, and quote the program name or the number 21559 . This is the download page for PresenTense Time Client - PresenTense Time Client is a network time client for all versions of Windows. 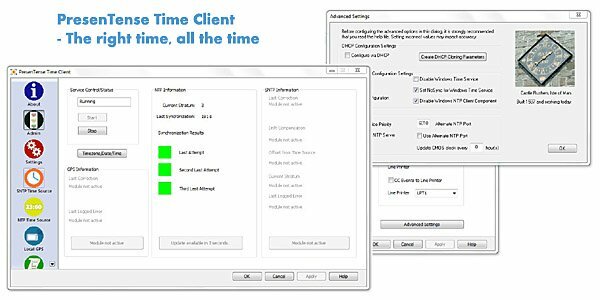 It synchronizes your PC system clock to a network time server or local GPS. Supports e-mail and SysLog alarms, redundancy and and can be centrally managed by LanTime Analyzer. Supports NTP4 and Free Run as required by NENA. Keeps your computer clock accurate within microseconds. PresenTense Time Client will impress you as it's easy to configure but has an impressive range of options you can configure. Installation and auto-configuration takes about 30 seconds. Optional tray icon can be activated and will show the status of the service. Moving the mouse over the tray icon will display the last log entry. New: All time clients on your network can be centrally configured via DHCP. Set or change the configuration options in your DHCP server and all your time clients will be modified. Automatic disabling of the win32 time client. For mobile devices, a locally connected GPS can be used to set the time. Email alarm action now supports all SMTP AUTH. PresenTense Time Client is trusted worldwide and installed on hundreds of thousands of government, military, 911 call center and corporate computers. The low cost of ownership (support and upgrades within the major version number included free) makes PresenTense Time Client a natural choice. PresenTense Time Client is synonymous with accuracy, reliability and value for money.